ow much does your privacy cost? It will soon be sold for half a Million US dollars. A controversial company specialises in acquiring and reselling zero-day exploits is ready to pay up to US$500,000 for working zero-day vulnerabilities targeting popular secure messenger applications, such as Signal, Telegram and WhatsApp. 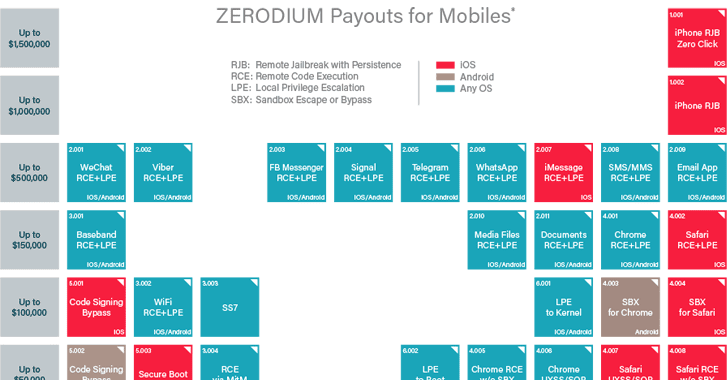 Zerodium announced a new pricing structure on Wednesday, paying out $500,000 for fully functional remote code execution (RCE) and local privilege escalation (LPE) vulnerabilities in Signal, WhatsApp, iMessage, Viber, Facebook Messenger, WeChat, and Telegram. The same payout is offered for remote code execution and local privilege escalation security flaws in default mobile email applications. Launched in 2015, Zerodium is a Washington, DC-based premium exploit acquisition platform by the infamous French-based company Vupen that buys and sells zero-day exploits to government agencies around the world. The maximum bounty offered by the company remains for Apple’s iOS devices with $1.5 million offered to anyone who can pull off a remote jailbreak of iOS devices without any user interaction, and $1 million for those that require user interaction. This payout was set last year when Zerodium raised the price for a remote iOS 10 jailbreaks from $1 Million to $1.5 Million, which is more than seven times what Apple is offering (up to $200,000) for iOS zero-days via its bug bounty program. The zero-day market has long been a lucrative business for private firms that regularly offer more payouts for undisclosed security vulnerabilities than big technology companies. Hackers will get the payout within a week of submitting the zero-day vulnerabilities along with a working proof-of-concept, though we recommend you to submit them to the affected vendors because it’s a matter of time when some black hat finds and uses them against you and wide audience. blockchain – A New Real-Estate Medium to Simplify Real-Estate?